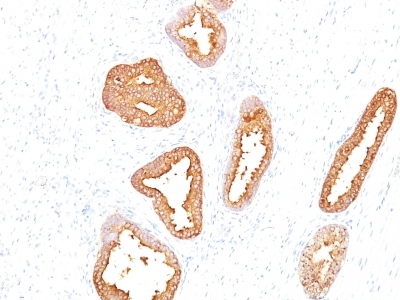 Recognizes a single protein of 33-34kDa, identified as the prostate specific antigen (PSA). 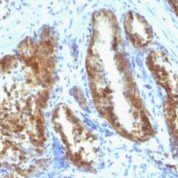 This MAb is highly specific to PSA, stains prostatic secretory, ductal epithelium in both normal, neoplastic tissues. 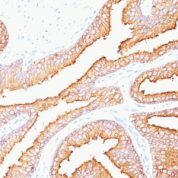 PSA is a chymotrypsin-like serine protease (kallikrein family) exclusively produced by the prostate epithelium,, abundant in seminal fluid. 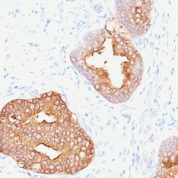 PSA can be detected in the sera of patients with prostatic carcinoma. It is predominantly complexed to a liver-derived serine protease inhibitor, alpha-1-antichymotrypsin (ACT). 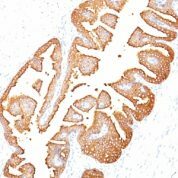 A higher proportion of serum PSA is complexed to ACT in prostate cancer than in benign prostate hyperplasia. 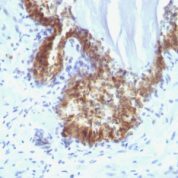 This MAb makes an excellent pair with MAb 1A7G6B6 for PSA tests.